Kafka's The Trial is not so much a piece of literature as it is an experience. I'm always amazed at its power to create a haunting, unsettling mood that remains with the reader long after its final words are read. As we experience the disturbing journey of one Josef K., we can feel the oppression of an unnamed system bearing down, driving events inexorably out of control. Kafka's classic is a cautionary tale, sadly brought to life on more than one historical occasion. 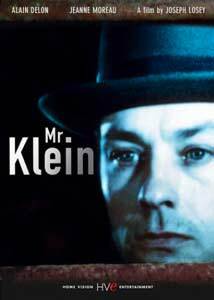 Joseph Losey's Mr. Klein manages to capture the aforementioned tone, hauntingly immersing the viewer in an unsettling world, rooted in history and rich in references. The setting is Paris, circa 1942. Robert Klein (Alain Delon) is a man of opportunity. As the many Jewish residents of France are being taken away by the occupying Nazis, Klein is expanding his art collection. He buys from Jews at rock-bottom prices, feeding off their desperation. He seems to be quite content in this sport, showing no remorse or hesitation. When a Jewish newspaper is mistakenly delivered to his door, he grows concerned. Apparently, he has been mistaken for another Robert Klein, a Jew. At first, this appears to be a minor inconvenience. As Klein meets with various individuals in order to clear his name and avoid further complications, he begins to experience the complexity and paranoia of the system first hand. But, he has faith in his friends, the Germans, the police and their cronies, resting assured things will clear up, despite a constant level of tension. When he is repeatedly mistaken for the other Klein, he takes matters into his own hands and embarks on a quest to find his doppelganger, and to discover why he is being victimized. This is a story of victim and oppressor, and how happenstance and mistaken identity can so easily turn the tables. If turnabout is fair play, what happens to Klein is no injustice. His plight is one of anxiety and error. Though we may find some kind of strange sense satisfaction in his trouble, we end up feeling guilty about it. This is Losey's intention�to play our perceptions and question our sense of reality. The script, written by Battle of Algiers scribe Franco Solinas, shows the French upper classes as perfectly compliant with the rampant anti-Semitism sweeping the country. Their apathy complicates Klein's situation. Delon brings a skilled, understated performance, showing fully realistic emotional duress in only one scene. His is a character of quiet tension, which seems to be a mood chosen by Losey. His handheld camera provides a sense of urgency, but his distracting, Altman-like zooms cheapen the look. Losey chooses to engage us on a more objective, intellectual level, using a sense of distance to make us an observer. As a result, I was never as involved in Klein's desperation as I would have liked. Some more emotional involvement would have made this languid, thematically ambitous thriller more impactful. Image Transfer Review: Home Vision's anamorphic 1.66:1 transfer is rather clean, exhibiting minor grain and no major print damage. However, the image has a frequently washed out appearance, which mutes color and detail throughout. This looks to be a problem with the source material. Audio Transfer Review: Spoken dialogue and music are clear and audible, but the soundtrack contains some noticeable hiss, pops and cracks. Not terrible, but it could have used some more restoration. The monaural audio is presented as a Dolby 2.0 track. Extras Review: Extras are minimal, and include the original U.S. trailer, and filmographies on Joseph Losey and Alain Delon. Joseph Losey's Kafkaesque treatment of WWII France is an interesting tale of mistaken identity and the thin line between victim and oppressor. Though it lacks real emotional involvement, there is enough thematic material to keep one engaged. Home Vision's effort is barebones, but worthwhile. Recommended, with reservations.